Chives are a great addition to the garden, any garden, does not matter what is growing already, add chives. These perennial herbs are great landscape edibles; they come back year after year. Chives (Allium schoenoprasum) are narrow plants, about a foot tall, so they can be tucked in between ornamental shrubs and flowers as long as they receive full sun. In my Virginia garden, my plants are already poking through the soil in early March and I can’t wait to cut the leaves for scrambled eggs, chive butter, and mashed potatoes. To keep up with my family’s demand for fresh chives, I have several plants so after I cut the leaves back on one, I leave that plant alone until it rejuvenates and then harvest the leaves of another plant. Usually we are harvesting the leaves so often we do not see the pink, clover-like flowers but the flowers themselves are edible and pretty in a wildflower-country-garden-way. In the spring, I divide my current clumps to create more plants, both for the garden as well as for friends. Chive can be grown from seed but it may take a while for the plants to mature to harvest so it is best to buy a few small containers in the spring and tuck them in different places in the garden (near the door so you can pop out with scissors before dinner). I always wash the foliage of course before eating but I have never seen pests. To make chive butter, simply let the butter come to room temperature, stir in chopped chives to taste, then refrigerate in a container. This can be done with soft cheeses as well. Chives can be preserved in the freezer, dried, or in ice cubes. Chives also can be used in herbal vinegars. Fresh minced chives add green to potatoes, soups, and rice dishes. Really, chives are so versatile in the kitchen and so easy to grow in the garden, there is no reason not to have them in your garden. Most people know about sage, it’s that dry, gray, crumbly herb you use when you make stuffing for Thanksgiving stuffing. True enough, the plant is an herb but it also adds beauty in the garden. Re-think culinary sage (Salvia officinalis) as a landscape edible: drought tolerant, pest resistant, and full season interest! 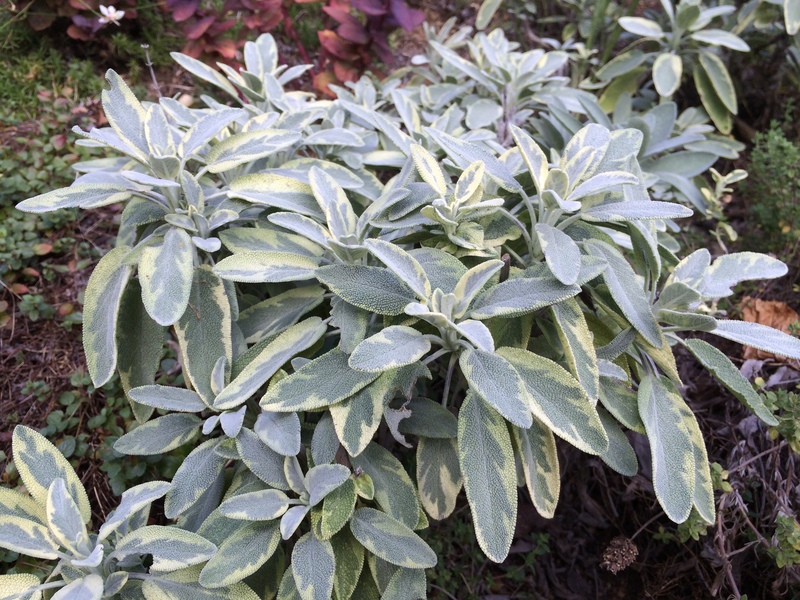 Sage plants grow like small woody shrubs, up to a few feet tall, and their leaves remain all year long in my zone 7, Virginia garden. Sage plants are usually grown for the leaves, but the summer brings small, purple flowers, attracting pollinators for the rest of the garden. Both the leaves as well as the flower spikes can be cut for flower arrangements. Leaves can be solid green, variegated with cream or yellow, gray, gray/green, blue/gray, purple, or tricolor (pink, green, and white leaves). As the year progresses, the tone of the color seems to change with some cultivars – this one in the photo seems to change from light green/yellow variegated to a gray/cream color by September. No matter what the color, all the leaves are edible. You can pick leaves when you need them without altering the shape or you can take a branch from the back and strip and dry the leaves for cooking or tea. 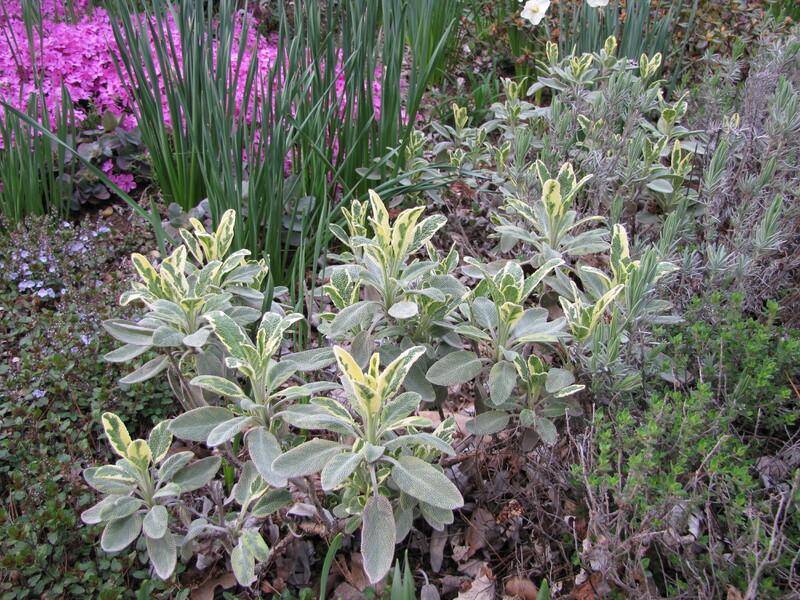 Sage plants prefer full sun and well drained soil on the dryer side, think Mediterranean. Although you can start the species from seed, check out the many cultivars that are available now for the full spectrum of foliage interest. 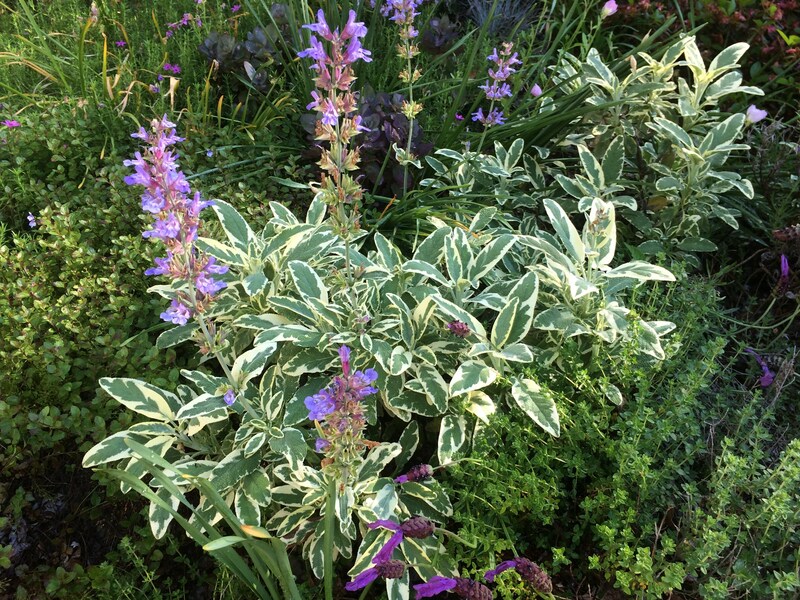 You can grow sage as a small shrub for your landscape! Posted in You Can Grow That! Tagged landscape edible, sage, Variegated sage, You Can Grow That!